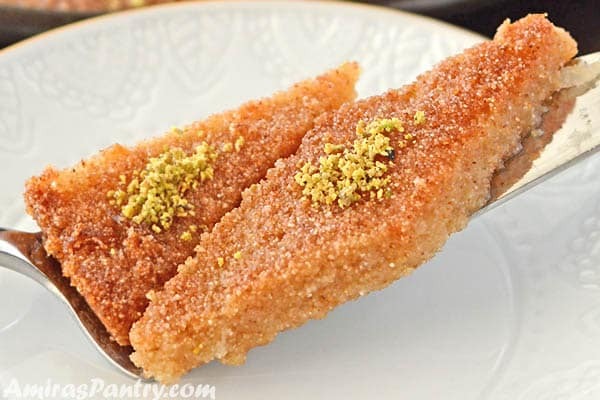 The best farina recipe ever, Basbousa, an Egyptian farina dessert drizzled with simple syrup and traditionally served with a hot cup of black tea/coffee. Sweet, soft and delicious. Hard to resist. I love my traditional basbousa recipe, but this one is different. It has an exotic soft texture and a different flavor. Also, this one is partially done on stove top. So you try both and chose which one you like most. This post has been updated from the original September 2017. Last updated March 2019. Egyptian style farina dessert , basbousa, is soft, sweet with a grainy texture. The best part of this recipe is, it is partially cooked on the stove shortening the time it takes in the oven. 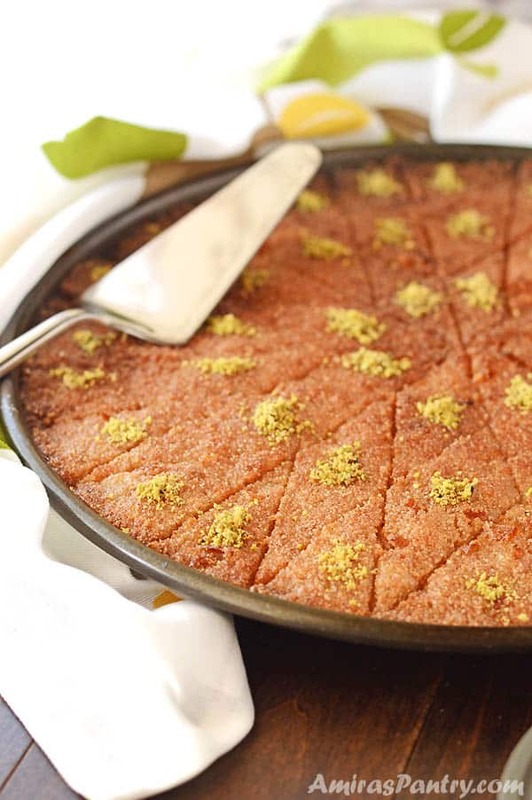 ِAn Eggless Basbousa cake made with Farina, some would call this Harissa others might call it Namoura but I call this Basbousa, a syrup-soaked Farina Cake. If you’ve been following for quite sometime, you know for sure now that I am still experimenting with homemade versions for basbousa. Why basbousa? because it is the queen of Egyptian desserts. 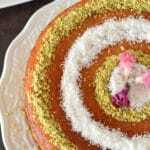 Everybody loves basbousa, this farina dessert has a charm of its own. 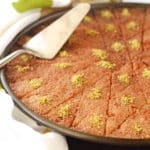 In my quest for the perfect basbousa, I stumbled upon a recipe that is not very common. The technique is quite new to me and the result was very promising. You just need to master the technique in order to get the desired results. It took me 5 attempts to know “the” how and “the” when. It is partially cooked on stove top then finished in the oven. So let’s see what is going on here. What is Farina made of? Farina or fark, is a cereal grain made from semolina. Do not buy the quick cooking type. Farina is available in the Middle East stores and online, I will link to it below. What is a substitute for Farina? Farina generally can be substituted with cream of wheat. Although, cream of wheat has a finer texture than farina some say you can use it instead. My opinion is no, you cannot in this recipe as the texture will be different and my guess is it will be more cake-y. What’s the difference between semolina and farina? Scientifically and according to google, semolina is made from durum wheat, which is sometimes referred to as pasta wheat. Farina, on the other hand, is made from hard wheat but not durum wheat. 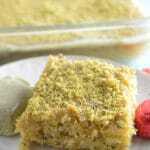 Semolina has a yellowish color and a texture closer to cornmeal. Farina has an off-white color. I have linked both below so you can check them out. On the stove top, in a saucepan add butter, honey and milk. Stir until butter is melted then add sugar and stir until completely dissolved. Add coconut flakes, you’ll notice I’ve used large sweetened coconut flakes in the video but when I made it with finely shredded unsweetened it was much better. Turn off heat then mix in the farina. Mix just until there is no visible dry farina. Now spread you basbousa mix evenly on a well buttered oven dish, dip your fingers in water so you can smooth the surface. Cut into squares or diamond shape and bake in the oven. Meanwhile prepare the simple syrup by combining all the ingredients in a saucepan and when it starts to boil reduce heat and simmer for 10 minutes. When the basbousa is done, you just drizzle the hot syrup over the hot basbousa. Over mixing is easy and this is tricky thing. 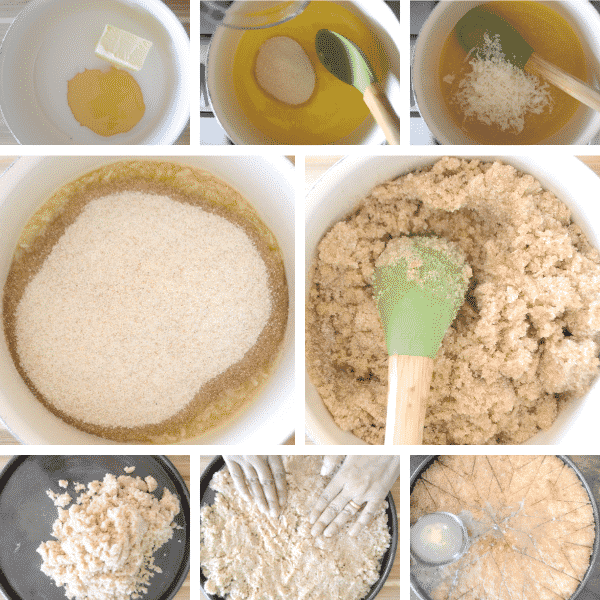 You’ll want to stir everything together until just combined but do not over mix. Just like when you make pancakes, if you over mix you’ll not get the fluffy thick pancakes you want. Over-mixing will make you end up with a tough and not soft kind of basbousa and this is not what you need. Hot or cooled syrup? 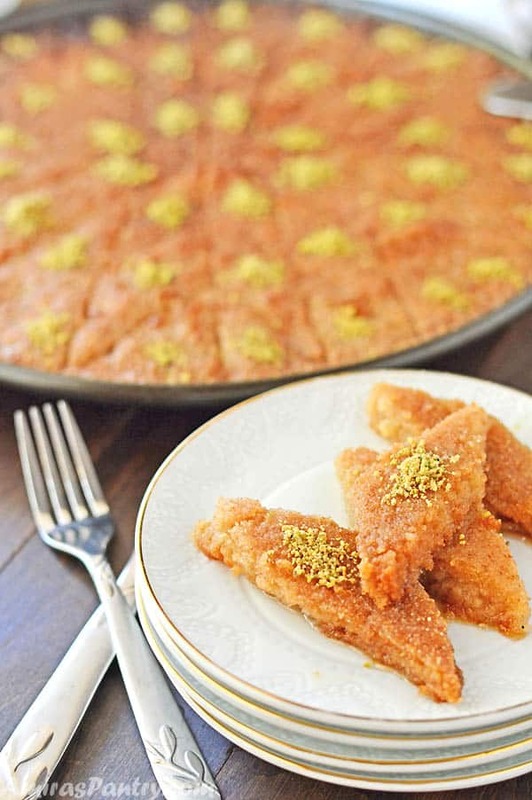 this is another debatable point, usually when drizzling middle eastern desserts with simple syrup like knafeh, one of the two has to be hot while the other is room temperature. For the basbousa it is a different story, I usually drizzle while both are hot or else my basbousa will be crunchy and will harden. Some people say that when both are hot they end up with a hard basbousa. So here is what I’ve done. I finish my syrup almost 5-10 minutes before the basbousa is done, so the basbousa is hot and the syrup is neither too hot nor has cooled down…. how about that!! Try to use light colored ( aluminum) pans: I know I am using dark pan but I’ve come to realize that light colored pans are the best for basbousa. If you cannot find aluminum then use glass, still will be better. For the Semolina and Farina Here are the two types from Ziyad company ( coarse, fine) which you can easily found in the Middle East store near you. For other brands like Mid East they go by the name farina for the coarse and semoline for the fine. 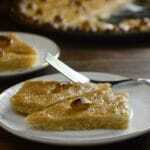 An Egyptian farina dessert recipe that is soft, sweet and so delicious. 1/2 cup 1 stick unsalted butter. 1/2-1 cup unsweetened finely shredded coconut flakes. In a saucepan over medium-low heat add butter, honey and milk. When the butter is melted and the mixture is not boiling, add sugar, stir to dissolve. Add coconut flakes if using and mix well then turn the heat off. Add the farina and mix until just blended, do not over mix. Butter a baking dish with low rim, spread the mixture evenly. Dip your fingers in water and press the mixture evenly in the pan. Cut the basbousa into the desired pieces, squares, diamonds or triangles add nuts if using then let it sit for 10 minutes. Bake for 15 minutes . If necessary broil on low until it gets golden brown. Meanwhile make the simple syrup, by combining all the ingredients together, bring to a boil then reduce heat and simmer for few minutes. Cover with foil and let it cool down before serving. 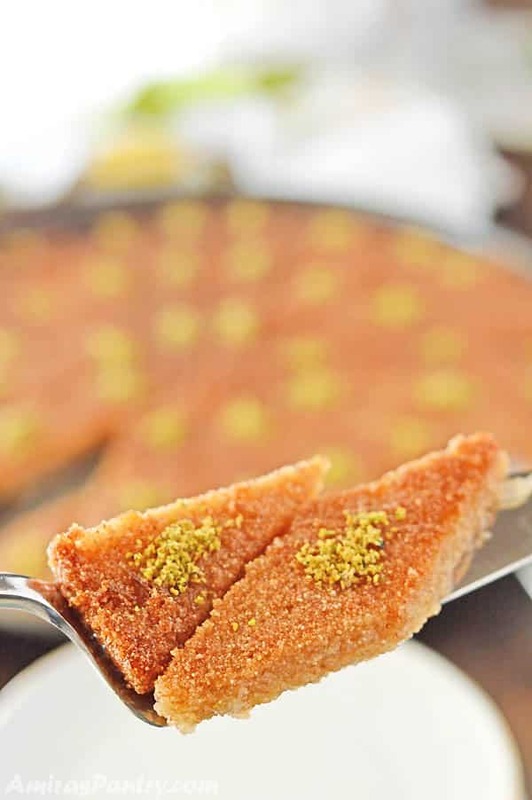 * I try to finish my syrup about 10-15 minutes before the basbousa is done so it is not too hot and not room temperature either… say post for details about this matter. Made this recipe already twice and we just love it. Great to hear Hafsa! Thank you for taking the time to let me know!